Last week, a local runner saw a bunch of dogs and runners out on the local trail. The group even joked that he was probably wondering why there were so many dogs hanging out in the parking lot when the park has a ‘Dog Free Zone’ sign at the entrance. Turns out, it was the opposite, he was a dog lover and joined us this week for a run. I asked if I could share an e-mail Tim sent to a few others about his adventure running with Fabian. His words sum up a first-time experience perfectly but happy to hear he’ll be back for another go-around in the future! Here I am with my Sunday running partner Fabian. Fabian is a shelter dog from the Better Days Animal Shelter in Shippensburg, Pennsylvania. 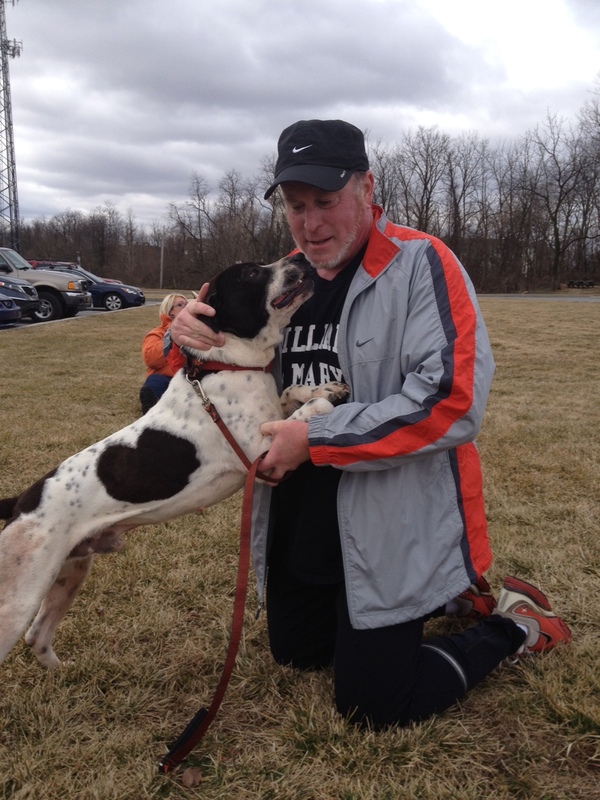 I met him through a group called Miles & Mutts – milesandmutts.com where simply said you run a few miles with a few mutts. Fabian is a true mutt looking like a spaniel, a bull terrier and at least three other breeds. Fabian never received the memo that stated I was to walk him and run him for four miles along the picturesque Shippensburg Bike Trail. Instead, Fabian dragged me like a tin can behind a Just Married car. We broke stride only to greet a shrubbery or fertilize the local farm land. After three miles of insane and Usain-like sprinting, we finally settled in to a comfortable trot for the final mile. It was rewarding to run free with this otherwise caged canine. At the turnaround point, Fabian jumped up on me as if to say, “Thanks for keeping up and freeing me from the monotony of puppy prison.” His bridled enthusiasm was matched by his dogged determination to catch whatever was in front of us. There were jogger Janes and Jogger Joes to overtake and other dogs hauling their human companion over the crushed gravel. Near the end, Fabian glanced sheepishly at cow no doubt dreaming of behemoth bovine burgers. A firm tug on his muscular neck brought him back to reality as we finished the trek in the sub-freezing temperature. As we took the turn from the finishing line, we met his kennel comrades bounding back and forth on the wet grass. This entry was posted in Uncategorized by abbi. Bookmark the permalink.